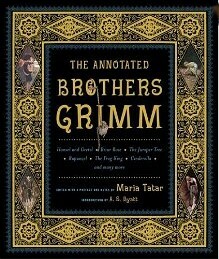 (2012) The Annotated Brothers Grimm Bicentennial Edition (update of the 2004 The Annotated Brothers Grimm), edited and annotated by Maria Tatar, introduced by A. S. Byatt. (2002) The Annotated Classic Fairy Tales edited and annotated by Maria Tatar. Grimm, W, Grimm J, Tatar M, Byatt AS. 2004. The Annotated Brothers Grimm, New York: W. W. Norton & Co.